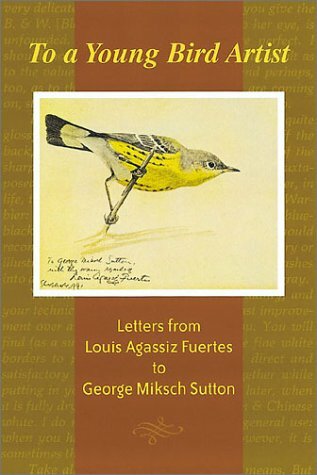 As someone who is learning to paint birds, I was very grateful and excited for the existence of this little book, which is made up of letters from Fuertes to Sutton as well as Sutton's notes and memories. It is wonderful both because it provides incite into how Fuertes worked and because it shows both artists' enthusiasm for bird painting and their absolute delight in being able to share their thoughts and paintings with each other. Definitely a must-read for bird and wildlife artists. George Miksch Sutton - George Miksch Sutton (1898 - 1982) was an American ornithologist and bird artist. He published numerous technical papers in ornithology as well as more popular works illustrated with his own art. His early artistic work was inspired and tutored by Louis Agassiz Fuertes. In 1931, he was the first ornithologist to find the eggs of the Harris's Sparrow, one of the last North American birds to have its nest and eggs described. He did extensive field work in the Arctic (including Iceland), Oklahoma, Labrador, and Mexico. He received his doctorate from Cornell University and held academic posts at the University of Michigan and the University of Oklahoma, Norman.